I am delighted to welcome you to the OECD Environment Ministerial meeting. Since we gather only every four years, it is an important opportunity to discuss the national and international environmental policy landscape for years to come. The adoption of the Sustainable Development Goals and the Paris Agreement on Climate Change will inevitably shape discussions. Not all of you are directly responsible for the climate or SDGs portfolios, but their scope extends beyond any individual Ministry’s agenda. Our environment is a shared responsibility. 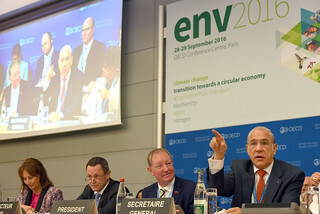 28 September 2016 - OECD Secretary-General Angel Gurría (right) speaking at the OECD Environment Ministerial. The OECD is part of this effort. A number of the SDGs link directly to the OECD’s environment programme of work; for example water (Goal 6); terrestrial and marine biodiversity (15 and 14); resilient infrastructure (9); certain aspects of energy (7), and the goal related to cities (11); and, of course, the climate action goal (13), where we work across mitigation, adaptation and finance streams with links to inclusive economic growth (8). We are already working with some countries like Slovenia on their development strategy to ensure its alignment with the SDGs. Other countries like Germany, France and Switzerland will or are preparing National Development Strategies. Others have moved or will move to implement national actions plans on the SDGs – for example Korea, Sweden and Finland. The climate focus is also on implementation. Paris was historic. But since the Intended Nationally Determined Contributions are simply not ambitious enough to achieve the goals, the monitoring, reporting and review elements of the Paris Agreement will be critical. The next key moment will be the 2018 facilitative dialogue followed by the 2023 Global Stocktake. The OECD-IEA Climate Change Expert Group is helping to ensure these milestones lead to an operational Paris Agreement. To limit climate risks and impacts, action on both mitigation and adaptation is required. It will be essential to build in flexibility and resilience to a range of outcomes. Water, for example, is one of the key sectors for adaptation. Last year, the OECD/GWP report on Securing Water, Sustaining Growth estimated that strategic investment in water security could contribute at least USD 500 billion to global growth annually! Once we understand how poor water management affects economies and where the need for investment is greatest, governments can ease bottlenecks and deliver the right finance at the right time and place. And because greening the financial system must underpin structural change for green growth, the soon-to-be-launched OECD Centre on Green Finance and Investment will provide expertise and a global platform to help catalyse and support the transition to a green economy. Since the launch of the OECD Green Growth Strategy in 2011, we have been trying hard to reconcile environmental with growth objectives across different agencies and ministries. Green growth is now a permanent feature in the Assessments and Recommendations of OECD Economic Surveys. And our Policy Guidance for Resource Efficiency can help to integrate resource efficiency objectives across different policy portfolios and ensure that environmental burdens are not simply displaced across the lifecycle. To move forward, we will need new – greener – business models. If these are to penetrate, it is vital that low productivity businesses with technologies well behind the frontier are allowed to exit the market. We need to ensure that our policies and regulatory frameworks allow dynamic firms to gain from environmental policies and boost economic growth as they go. As our Aligning Policies project shows, there is no shortage of barriers to achieving resource efficiency goals but many of these lie beyond the realm of the Ministry of Environment. For example, it is crucial to have finance ministers on board. A familiar refrain we hear from environment ministers is “If only we can get finance ministers more actively engaged in our discussions as they are the ones with a hold on the public purse strings!” But how do we put the environment on the radar of a Finance Minister? Well, let me give you some arguments that you may use with your finance ministers. First, the cost of inaction. If we don’t act with sufficient force there will be severe consequences that sooner or later we will have to pay for. The effects of droughts, fires, floods, hurricanes, will have and are already having a toll on our budgets. It’s like with health. When you spend one dollar in prevention you save between 6 and 10 dollars in attention or curing. It’s the same with the environment. Second, the human cost, health. Bad air kills. Outdoor air pollution could cause 6 to 9 million premature deaths a year by 2060. And many more will get diseases that demand long-term healthcare, putting our health and pension systems into additional stress. So the human problem turns with time into an economic problem. Third, we need to remember that this is a problem of shared responsibility. If one country acts and the others don’t the problem cannot be solved and we will keep kicking the can along the road. But this is a road that leads to a precipice! We need a cooperative effort between countries and between ministries and the private sector. Finance ministers can lead the charge. I’m talking about enlightened self-interest. We know inaction is the most expensive of all available and know courses of action, as we have documented in our Environmental Outlook to 2050: the Consequences of Inaction. Fourth, we need to see this as a challenge of intergenerational responsibility. Finance ministers are generally worried about the fiscal deficits, about debt, because they don’t want to leave a heavy or unsustainable burden for the next generations. They don’t want to leave a legacy that will erode the quality of life of generations to come. Exactly the same should happen with the environment. This financial sector has a lot to contribute, with better regulation focused on green growth projects and removing obstacles to investment in clean energy and infrastructure. The problem is not about convincing finance ministers; the problem is that we cannot tackle our environmental challenges with only ministries of environment. They have already told us what will be the consequences of inaction. Now it’s time for the other ministers to act accordingly, with vision and leadership. But not only finance ministers. What about the ministers of economy, trade, industry. They need to chip in to help us change the industrial metabolism of our nations. What about the ministers of agriculture needed to promote the new green ways to use land and water. What about the ministers of interior and culture, who need to regulate the constant bombardment of mass media marketing campaigns turning people into compulsive consumers. What about the export credit agencies that are still promoting deals for coal-fed plants, or the development agencies and international finance organisations that are still engineering cheap loans for developing countries that are tempted to launch projects powered by dirty energies. We need all on board! Dear Ministers, Ambassadors, Colleagues: This is not about allocating resources. It’s about the ultimate political responsibility of leaders. With so much evidence around, it is now for leaders, Presidents, Ministers, Parliamentarians, regulators, and political parties to push for the right solutions. So let’s not put too much responsibility on finance ministers. In the end the finance ministers will allocate the resources according to the priorities set by their political leaders and the parliaments, who represent the people. The people don’t know exactly how bad the air is, they don’t know exactly how polluted the water is, they don’t know the exact relation between investment decisions and environmental degradation; but we do and we have a moral responsibility to protect them and put the environment first, to put their lives first. We are fortunate to have with us both the French and the Moroccan Ministers of the Environment, who will each now briefly set out where we are on the road to Marrakech. Minister Royal, Minister El Haite, we look forward to hearing your views.